Our tapestries are gorgeous wall hangings made of high quality materials and make incredibly impressive additions to any home decor. These medieval and Renaissance tapestries are perfect for evoking eras of history and the art that accompanied such times. Varying in size, we offer both small and large tapestries. Some are replicas of historical works of art and others are original works done in a historical style and displaying cities as they appeared in ancient times, such as our Medieval Tapestry of Toledo Spain. 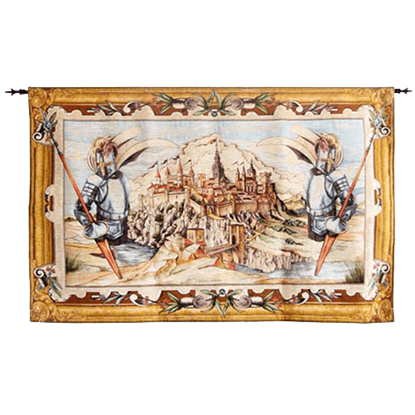 If you are looking for a piece of medieval wall decor that is both extraordinary to behold and tasteful in its styling, then our high quality tapestries are perfect for you. This tasteful Medieval Tapestry features the City of Toledo, Spain, flanked on either side by a single armored knight wielding a halberd. Tasteful and elegant, the Large Medieval Tapestry of Toledo Spain, by Marto, is a beautiful item.